Four Winds, headquartered in Sonoma County, California, also offers locations in and around Southern California. High impact teambuilding and leadership development programs are held at multiple locations, both for day use and overnight accommodations. Four Winds South programs are designed to meet individual needs and goals of each group that we serve and are designed to be high impact with lasting memories and results based on your requirements. The Four Winds team focuses on providing adventure programs in a controlled environment at day-use camps and/or conference centers with meals and overnight accommodations. Through partnerships and strong relationships, Four Winds is able to offer high impact programs at more locations than any other company in California. A premier camp in Big Bear Lake, one of only two camps with lake front property in the Big Bear area. The camp is an excellent choice for summer, spring and fall programs. Nestled in the verdant foothills of the Verdugo Mountains just 15 miles from downtown Los Angeles, Camp Max Straus is an ideal setting to host your next community or corporate retreat. Nestled in the beautiful San Bernardino Mountains of Southern California, Alpine Meadows Camp and Retreat Center is the perfect site for affordable group retreats of all kinds. This location offers fresh air, mountain vistas, gorgeous wooded acreage, personalized service and the best facilities around. Through the decor and amenities, El Capitan campground resort provides a measure of comfort and pampering-from healthy Saturday night dinners to a variety of wellness treatments. The ultimate in glamping for youth and adult groups. A delightful park like site located in a beautiful green belt in Long Beach, CA. Easy to get to but set away from the hustle and bustle of the city. A great location for half and full day teambuilding events. Surrounded by sycamore trees, quail, and the refreshing canyon breeze, Tumbleweed Day Camp offers the natural environment of the Santa Monica Mountains for your next scheduled private event. We operate on over 100 secluded acres just north of Sunset Boulevard, in Brentwood, which makes our pristine location easily accessible from all over the greater Los Angeles area. ©2004-2016. All Rights Reserved. 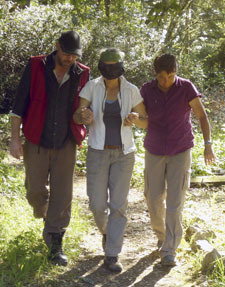 Four Winds Ropes Courses: Teambuilding That Works.